This Irish Christmas ornament features the iconic Claddagh, the Irish symbol of love, loyalty, friendship. 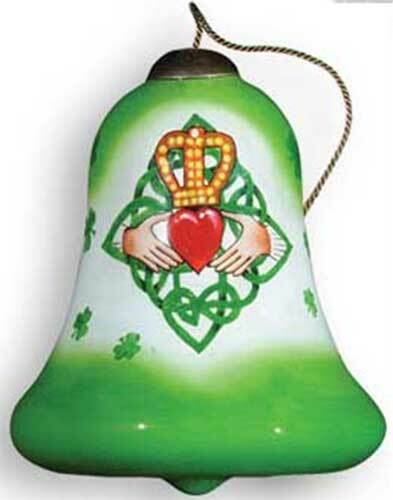 The Claddagh Christmas tree ornament is 3” tall and is bell shaped. The Irish ornament is enhanced with shamrocks and Celtic knots along with a gold cord for hanging on your tree. It is made by Ne'Qwa and is elegantly gift boxed with certificate of authenticity. The Irish ornament is complete with Claddagh, shamrock and Celtic knot history cards, complements of The Irish Gift House.